Leonardo studied mechanical wings for a long time and this is a reconstruction of one of the many projects for a flying machine documented in Manuscript B. In his fascination with flying, Leonardo attempts to combine the dynamic potential of the human body with an imitation of natural flight. 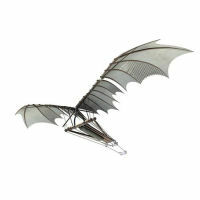 In his notes, he cites the bats, the kite and other birds as models to imitate. He refers to his flying machine as the “great bird”. In the drawing for this flying machine Leonardo does not include the wings, as this is mainly a study of the mechanism for the folding of the wings. This occurs thanks to a system of pulleys and rods which is activated by the feet of the pilot. The pilot lies supine on a wooden surface and sets the mechanism in motion by pushing two pedals with his feet in an alternating motion. The movement of the wings imitates bird flight. For safety reasons, Leonardo suggests that the machine should be tested over a lake and places a floatation device under the structure to keep the machine from sinking if it falls on water.